Three COSPECT® pressure-reducing valves from TLV Euro Engineering have proved their performance and reliability in a recent sterile services trial at Blackpool Victoria hospital. As in most hospitals, the Blackpool Victoria's steam plant plays a vital role by delivering high-quality steam to the hospital's two autoclaves, which were installed more than 10 years ago. Due to the complexity of the autoclaves, when they were installed the hospital's 7 bar main steam supply was fed into a single pressure-reducing valve to reduce it to 4 bar before being fed into two separate pressure-reducing valves, which deliver the 2 bar of steam required by each autoclave. The quality and temperature of the steam supplied to the sterilisers is constantly monitored by staff in the hospital's control room to ensure that it is meeting the standard required to sterilise effectively. An alarm is sounded if the stringent preset parameters are not met. The system safeguarding the quality of the steam supply also highlighted the fact that despite fitting a separator, steam trap and air vent for each valve, maintaining the quality of the steam supply to the autoclaves required frequent adjustment and fine-tuning of all three pressure-reducing valves. Bill Haughton, technical officer at Blackpool Victoria, said that besides requiring frequent and costly maintenance, the pressure-reducing valves proved so unreliable that all three needed to be removed every six months for service kits to be fitted. This involved holding two spare valves costing GBP2,000 each, which, to minimise downtime, were kept in the plant room itself, rather than in the stores. When TLV Euro Engineering explained the benefits of its COSPECT® high-precision pressure-reducing valves nine months ago, Haughton accepted the offer of a trial on one of the autoclaves. 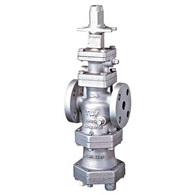 Besides having a built-in separator and steam trap to simplify installation, the accuracy of the COSPECT® secondary pressure to secondary set pressure is within +/- 0.01MPa, which ensures that even if the steam flow to the autoclaves or the primary pressure at the pressure-reducing valve changes, the valve's shock-absorbing spherical piston supplies steam at a constant pressure. In practice, this meant that it maintained the temperature of the steam used as the autoclave's heating source and did not require constant adjustment. None of the three COSPECT® installed have needed any adjustment since being installed over nine months ago. In addition, the valve's separator achieves 98 per cent condensate separation efficiency so any condensate in the steam is separated out. A strainer further removes any scale and the condensate that is separated out is quickly removed through the built-in free float trap. The noticeable improvement in the quality of the steam also results in an improvement in the heat conductivity of the steam. Maintenance is also simplified thanks to the COSPECT® modular construction and use of PTFE gaskets, which makes it quick and easy to remove or maintain inline.